Recipe Cards make a great housewarming gift for your favorite cook in the family or for your cute newlywed couple. 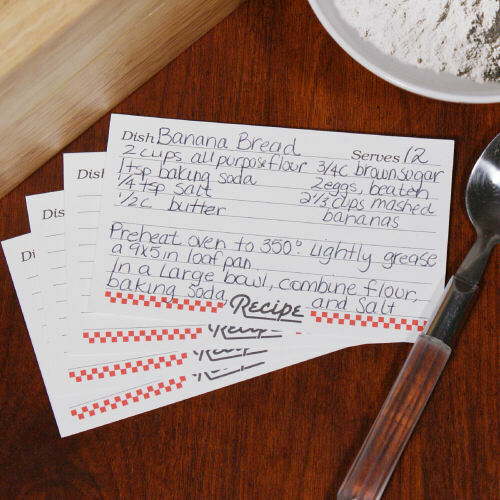 Each recipe card provides ample writing space for even the most complicated recipe instructions. A single order includes one bag of 24, 4" x 6" Recipe Cards. You may also like... our 4" x 6" Engraved Kitchen Recipe box. One bag of 24, 4" x 6"
Well made and will fit nicely in the recipe box. GiftsForYouNow.com has many unique items for your special gift-giving needs. We specialize in Personalized Housewarming Gifts, Personalized Cooking Aprons plus much more.